A Monster Invasion: Mind Candy | U.K.
Never heard of MoshiMonsters.com? Then you’re obviously not a parent of a 6-to-12-year-old. The social-gaming website for kids, where players (with parents’ permission) adopt and virtually care for pet monsters with names such as Luvli and Furi, has attracted 65 million users worldwide, up from 50 million a year ago. It was created by Michael Acton Smith, a London-based entrepreneur who is turning Moshi Monsters into an entertainment juggernaut. His company, Mind Candy, has granted 130 licenses to turn its stable of more than 200 characters into everything from plush toys to trading cards and magazines. With merchandise and premium website subscriptions, Mind Candy had about $100 million in sales last year. These are multitalented monsters. The Moshi Monsters album outsold Madonna, reaching No. 4 on the U.K. charts in April. A dedicated YouTube channel features Moshi Monsters music videos like « Moptop Tweenybop (My Hair’s Too Long), » and Acton Smith is in talks with film producers about a possible movie. Although now a marketing Godzilla, Moshi Monsters didn’t take over the tween world until mid-2009, when Mind Candy introduced social networking and allowed monitored chatting among players. « That’s when we realized that kids like to show off online just like grownups, » says Acton Smith. As marketing insights go, that one proved to be a monster hit. Smart Shopping: Shopkick | U.S.
« Showrooming » customers, who browse merchandise in person only to buy it online for less, are retail’s newest bugbear. How to keep them in the store and spending? Cyriac Roeding, co-founder and CEO of Shopkick, has an answer: make the trip worthwhile. « Until now, no one has rewarded anybody for coming through the door, » he says. Launched in August 2010, the Shopkick app allows its 3.5 million users’ smart phones to communicate with a store via its music system. When a customer walks into a participating store, his smart phone picks up an inaudible signal sent by the same speakers piping in Muzak. The app then sends offers for real-time deals and a chance to earn « kicks » by entering a shop, scanning products and buying merchandise. Those kicks turn into rewards — gift cards, cruises or other products — and Shopkick gets a percentage of each kick. « Shopkick allows people to interact with the physical world in a completely new way, » Roeding says. Flexible Benefits: MC10 | U.S.
MC10’s flexible electronics can bend like an Olympic gymnast. Silicon is usually rigid, but MC10’s co-founder John Rogers discovered that slicing the material ultra-thin — to 100 nanometers thick — allowed him to create flexible circuits. MC10, based in Cambridge, Mass., is using the technology to create wearable or implantable electronics, sensors and circuits that could be attached unobtrusively to clothing or even skin. The result is near invisible computer chips that can closely monitor the body in real time, without the bulkiness of current medical sensors. Instead of being connected to machines by wires, very sick patients could wear the diagnostic equipment found in a standard intensive-care unit. « We’re trying to break out of the flat world and reshape electronics into comfortable materials that stretch and flex, » says David Icke, MC10’s CEO. MC10 is already working with Massachusetts General Hospital in Boston to put flexible microprocessors on the tips of cardiac catheters, allowing doctors to monitor heart activity more precisely. 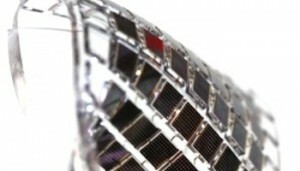 The company has also announced a partnership with Reebok to create products with flexible sensors. The clothing could eventually measure hydration or electrolyte levels, giving athletes in-game feedback and pushing high-performance sportswear to a new level. Energy Boost: Azuri Technologies | U.K.
To glimpse the future of energy, head west across Kenya, past Lake Nakuru’s million flamingos, until, near the Ugandan border, you reach the tin-and-grass-roofed houses of Kokete. Like thousands of other villages in Kenya, it is not on any grid. The result has been a classic poverty trap: villagers are unable to pay for power lines to their homes, and lack of power, in turn, keeps Kokete poor. Its residents are among the more than 1 billion people in the world with no access to electricity. To work, study or communicate productively, they have to buy paraffin for lamps or spend hours traveling to the closest mobile-charging station. Elvesjo founded Tobii Technology in 2001 with Marten Skogo and Henrik Eskilsson, both trained as engineers. All three are still with the company; Elvesjo is the chief technology officer. Tobii’s products allow disabled people who may not be able to speak or use their limbs to communicate and control computers by moving their eyes. 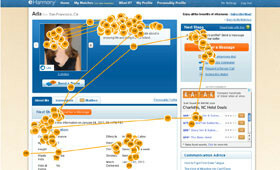 Tobii equipment also helps improve the usability of software and websites, as researchers use it to analyze where people in focus groups direct their attention while looking at the screen. Other applications are in the works, from medical research (eye tracking may help in the early diagnosis of autism) to automotive safety (it notices the fluttering eyelids of a sleepy driver). Seaworthy: Liquid Robotics | U.S.
For land-based beasts like humans, going aquatic requires loads of hardware, lots of fuel and plenty of money. But Liquid Robotics of Sunnyvale, Calif., is developing a better, fuel-free, entirely fishlike way to get around. Known as the Wave Glider, the new system is really two systems — a 2-m surfboard-like float covered with solar panels and a multiwinged glider suspended beneath it, connected by a 6-m cable. When dropped into the ocean, the device drifts wherever the waves carry it, but engineers can control a rudder on the glider to point it where they want it to go. That, plus the motion of six mobile wings, converts the up-and-down shifting of the waves into forward movement. In India, milk is not taken lightly. Cows are sacred, and a large chunk of the population is vegetarian, so it’s an important source of protein. The largest producer and consumer of milk in the world, India gathers it painstakingly, mainly from thousands of small dairy farmers — each with four or five cows — who bring buckets twice a day to a collection center. Trucks pick up the milk and race it to the nearest reliable chilling center before it spoils. Electricity is spotty, especially in villages, and refrigeration a dicey business. So when entrepreneur Sam White went to India in 2007 to talk to dairies about a solar device he was developing with an MIT-trained engineer, Sorin Grama, he got an earful about the importance of a consistent energy supply. « The level of milk spoilage in India is about 30%, » says White. Solar was not going to work. With a new understanding of the issue, Grama designed Promethean Power Systems, a milk-refrigeration device that relies on a thermal cell that operates like a rechargeable battery, drawing energy from the electric power supply at night when it is plentiful and storing it for when it’s needed. When the farmers pour milk into the contraption, the milk is instantly chilled and stays that way, even if the power goes out. There’s no need to back the chillers up with diesel generators, which are expensive to run and maintain. « It’s almost like we make ice inside this battery, » says Grama, « and we melt the ice when the electricity is off. » The dairy’s head of milk procurement can even check on the chiller via SMS. 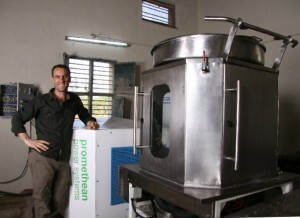 Four Prometheans have been installed so far, and one dairy has ordered 50 more of the $9,000 machines. Spoilage rates are just as high for fruits and vegetables in India, and Grama and White hope to develop a similar system to keep produce fresh from the field.